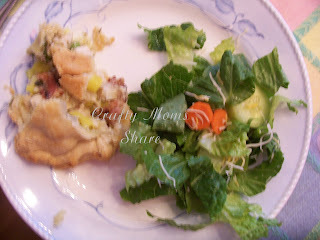 Irish Chicken and Leek Pie--and some signs of spring! Well this year (March through February) I have joined some great bloggers in traveling the world through dishes. Our first stop is Ireland. Since I shared a bit about Ireland the other day with the first of the Irish Cinderellas, I will skip doing it again. I am very excited to join this group, because I see it as such a wonderful way to expose Hazel to new cultures and countries and for her to learn a bit more about the world. 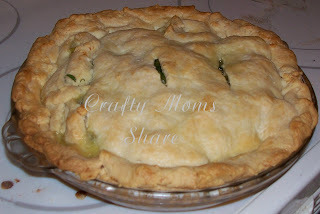 Before we take our trip to Ireland, however, I am going to share with you the reason we did not make Irish Soda Bread today and why Hazel did not help me with the Irish Chicken and Leek Pie for dinner. We had a beautiful feels like spring day. So we went out to play this afternoon. When Steve got done with work, he came out and I came in to cook dinner and go to my Weight Watchers meeting. 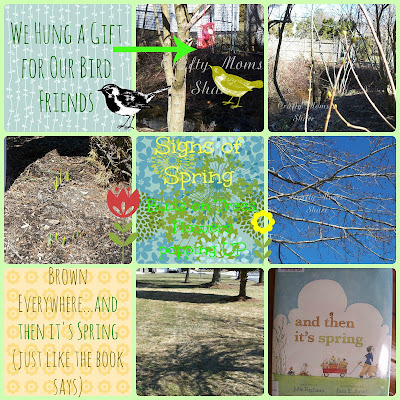 Hazel and I went on a walk around our neighborhood looking for signs of spring. 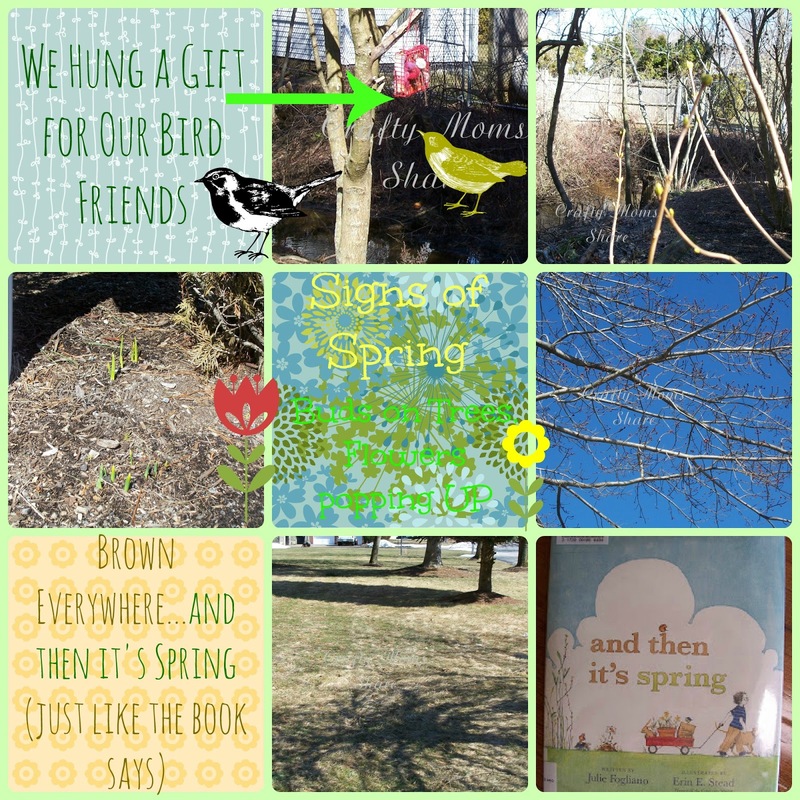 We saw budding trees, birds, and the tops of flower plants poking up. We went home and filled a suet feeder with scraps of yarn, wool roving and ribbon and hung it on a tree and we filled the bird feeder. Then Hazel pulled out her magnifying glass and eventually pulled out her garden shovel and rake and dug in the garden. When I came back out, Hazel had been joined by our next door neighbor who is eleven but still loves to play with Hazel and they were having a great time rebuilding their fairy house. 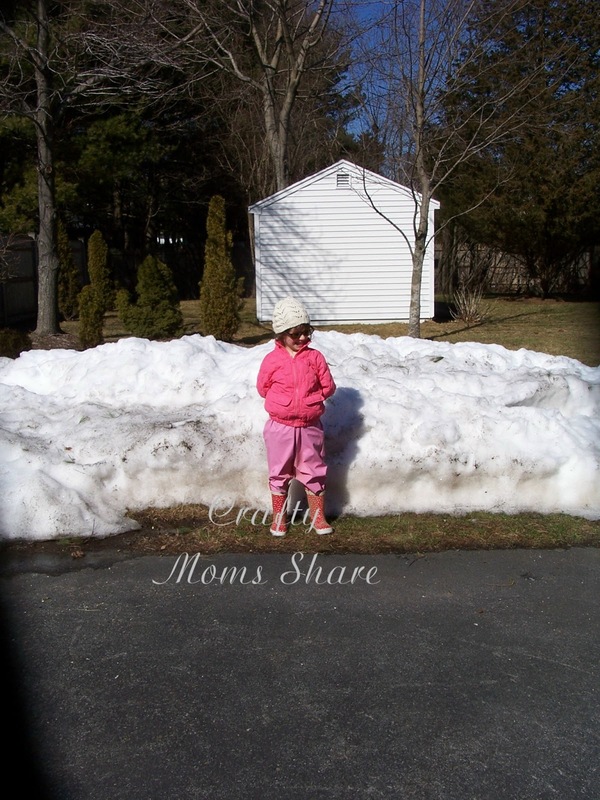 And for those of you who read our post about the snow storm last week, here is what is left of Hazel's snow mountain. It is amazing how fast it is melting!! I am glad robin has woken Sister Spring up! Ok, now back to Ireland! Today we tried a recipe from a book I got out of the library, Cooking the Irish Way by Helga Hughes. It came from the children's section so I thought it would be great to get Hazel and I trying some Irish cooking. I decided to try the chicken and leek pie. I was not sure how Steve and Hazel would feel about the leek aspect, but figured I would give it a try. Overall, we all loved it. Hazel was not totally sure about the leeks, but ate them mixed in with everything else. I did change the recipe a bit, but not too much. Preheat oven to 400 degrees F. Press one of the crusts into pie pan. Cook/heat bacon in microwave and then chop it. In skillet heat oil. While heating put chicken and leeks into large ziploc bag and add flour. Shake to coat chicken and leeks with flour. Put chicken and leeks into oil and discard excess flour. Stir and brown leeks and chicken. Remove from heat. Stir in the bacon, rosemary, pepper, milk, sour cream and mixed vegetables. Then spoon into pie crust. Sprinkle parsley on top. Then cover with second pie crust. Glaze with milk by using brush or paper towel. Cut slits in pie (unless you used a frozen one like me and it already had slits/cuts through it). Put in oven for 20 minutes at 400. Then turn temperature down to 350 and bake for 15-20 minutes longer, until crust is a light golden brown. We had ours with the suggested salad. Then Hazel and I had strawberries for dessert. A delicious meal!! 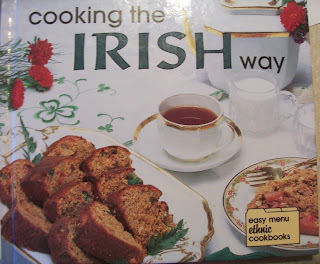 We will be trying some more Irish recipes this week, so stay tuned!! JDaniel would love that the pie has bacon in it.